Visit Label Your Stuff online at LabelYourStuff.com for every conceivable label you could ever need or want. 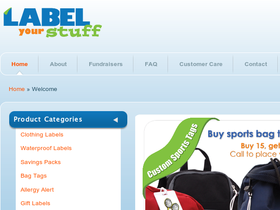 Label Your Stuff has labels for clothing, gifts, books, bags, shoe labels and much more. Label Your Stuff carries waterproof labels as well. Label Your Stuff labels are bright and easy to read. Save on your next purchase from LabelYourStuff.com with Label Your Stuff discounts, Label Your Stuff coupons, Label Your Stuff promotions and Label Your Stuff savings from 58coupons.com. Label Your Stuff is offering savings of 30% on the Trio Savings Pack which has everything you need to get three kids organized. Save 20% on the Starter Savings Pack from LabelYourStuff.com. Save 25% on Back to School labels from Label Your Stuff. Click link to start saving.